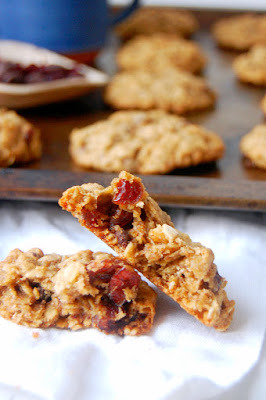 Oatmeal Cranberry Pecan Cookies have a chewy, moist consistency and are packed with a mix of favorites: rolled oats, chocolate, pecans, and cranberries. Perfect for holiday baking! The holidays have crept up on us. Well, maybe just me. I’ve seen holiday recipes on Pinterest since July. 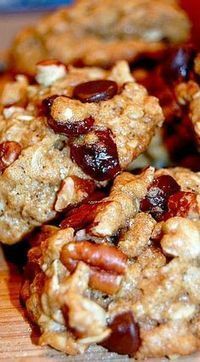 Here’s a tasty recipe for some Oatmeal Cranberry Pecan Cookies.. some chocolate got in there too! In a bowl, combine butter, oil, and vanilla. Mash until butter is soft. Add in sugars and stir to cream them together, and then stir in an egg. In a separate bowl, combine oats and hot water and let it sit for 5 minutes until oats are slightly softened. Add them to the wet mixture. Add in flour, cinnamon, baking soda, and salt, and stir to combine it all with the wet mixture. Add in your mix-ins (no more than 1 cup of total assorted mix-ins). Refrigerate dough for at least 10 minutes. Measure out tablespoon-sized cookies, and bake them onto parchment lined cookie sheets for 12 minutes, or until the bottoms are golden. Let the cookies cool fully before removing them from the baking sheet. Skipping steps to allow the oats to absorb moisture, or letting the dough sit before baking, may result in flatter cookies than pictured. 0 Response to "OATMEAL CRANBERRY PECAN COOKIES"